It seems only appropriate that my first post is posted the day after Halloween. Since this is a fashion-type blog and all. So, I might as well start with my costume. See how slimming high rising pants are? Now, I want you to know that this costume was put together within a forty-eight hour time period. . And I honestly wasn’t happy with it. I originally wanted to be a rock star: skinny jeans, big hair, raccoon eyes, red lips, black nails. I never look like that. I never wear skinny jeans, or makeup, or nail polish, and I sometimes forget to brush my hair, let alone style it. So I thought this could be my one night of non-me-ness. When my parents got a whiff of what my costume looked like, however, plans changed . . . I guess I looked more like a bad girl/prostitute than a regular rock star. And since it was a church event. And since I didn’t want the pastor to witness to me. I changed costumes. 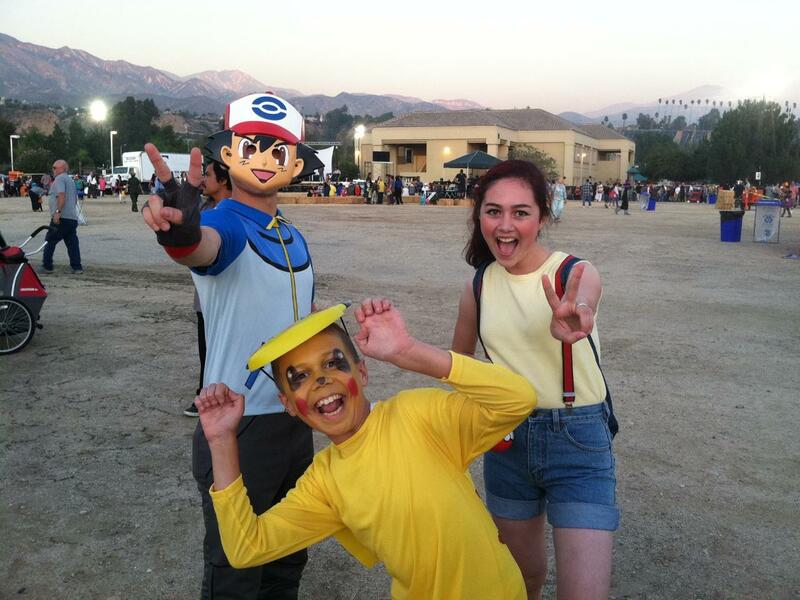 Wandering through the costume isle in Walmart, someone in my family – I forget who; it happened so fast – found an Ash Catchum costume (from Pokemon. Forgive me, poke-fans, if I spell his name wrong). Then, we stumbled over Pikachu. Within five minutes (miraculous, considering it was a Walmart mess), we had found my older brother an Ash costume, and my little brother a Pikachu suit. 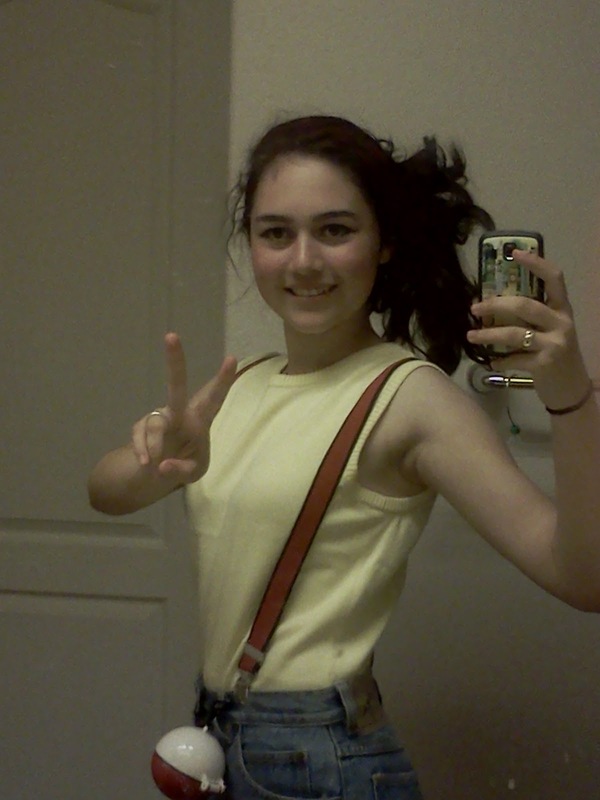 “Too bad there isn’t a Misty costume.” My little brother commented. I’m telling you, if light bulb ideas could be manifested like in the cartoons, customers would’ve mistaken that isle for the lamp section. All four members in my family seemed to have the same thought. Misty wears high (to the bellybutton, I mean) jean shorts that are rolled up, a yellow tank top, red suspenders, has a little backpack, and carries around a Pokemon called Togapi. Good news: I had the red suspenders already. More good news: Nah, that was about it. I do remember a time where I was getting frustrated and wanted to toss the whole thing. We would never find the right outfit. Tank tops were out of season. It takes forever to find jeans that fit me. Bla-bla-bla. Luckily, I snapped out of it before the first thrift store. It was the self-satisfying thought of sacrificing for my brothers brought me to reality. So I got to work. To the shock of this poor father and daughter, I lunged (most literally) for the first pair of jean shorts I saw and ripped them off the hanger. But it was in vain. Men’s shorts (not that that’ll stop me), but I could fit two of me and a friend in there, and that wasn’t the look I was going for. I went through the jeans isle. At least what I thought it was. Then I found I was in girls. (No wonder they were skinny.) Then I was in boys. (No wonder they were baggy.) Where the heck were the shorts? I thought I found them, but it was just mini skirt after mini skirt. I think it was my mom who found the shorts I ended up getting. And without trying them on (a recipe for disaster in my experience), I got those and a sweater/pull-on yellow vest type thing. It could go for a tank top. So far, I was off to a good start. If these worked, all I needed was Togapi. That dumb doll. Let me tell you. It took hours of walking around the mall to conclude that it wasn’t anywhere near the mall. We tried Target, K-mart, thrift stores, WinCo. I spent a morning researching online. I tried toy store after toy store. Amazon and Ebay kept coming up. But I needed it here and now. We looked in the toy section, dog toy section, the pillow section, the bed sheets section (thinking I could find an outline and stuff it). But nothing. I ended up going to the Harvest Festival with a pokeball. But I did find a backpack kind of like the one Misty has. The shorts gave me a scare. I almost couldn’t button them. X”-) But I sucked it in. Personally, I like pants that are high. I think they smooth out any muffin tops. So I loved these shorts. I think they stretched a little during the night so I was able to breathe eventually, and it all worked out. I probably looked better then I would in the rock star outfit anyway. 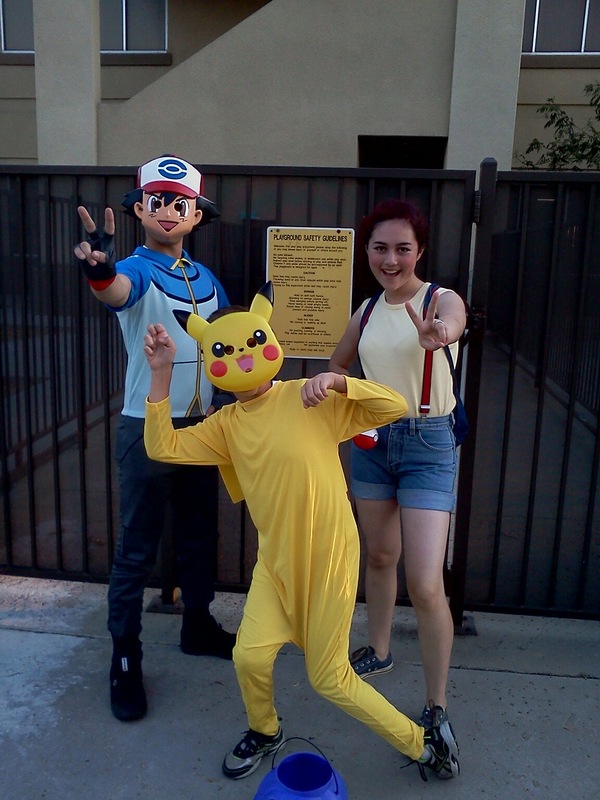 So the trio of us walked in, ready to win our candy: Ash Catchum, Pikachu, and me, Misty. Pikachu without mask. My mom did the makeup.